The Janka hardness test measures how hard wood is. The Janka Hardness test is designed to measure the density or hardness of different types of wood. Generally, the higher the Janka hardness test rating, the harder or stronger the wood will be. The test is done by measuring the force that is required to drive in a steel ball into a specific plank of wood. Janka hardness test is very important when it comes to choosing a new floor. It reveals the extent of possible damage that can occur when the floor is dented. It also shows how hard a specific wood is to nail or saw. It is essential to mention that Janka hardness test should only be utilized as a guide when evaluating different woods for flooring. Each type of wood comes with its own dynamic nature and understanding that will enable you to make the right decision. For instance, Oakwood is a relatively soft and pliant wood but it is one of the most common solid hardwoods that people use for flooring in their homes. The implication of this is that a hardwood does not always mean the perfect choice. In this article, we will go through detail with you what is Janka test measure, Janka rating of different kind of species, and how to use Janka rating to your advantage. Therefore, the factors you need to consider when deciding on the resilience and maintenance requirements of your wood floor should include the plank construction, and perfect finishing. How is Janka Test Measured? Janka hardness rating is the industry standard when it comes to deciding on the suitability of a wood for flooring purpose. The test measures the required force necessary to drill in a standard sized steel ball of about 0.444in by 11.28mm diameter halfway into the surface of a standard sized wood sample. The model wood sample is expected to come with about 12% moisture content, and clear of any knots. It should be a firm block of woods with the minimum dimensions of 2”x2”x6” long. When a test is being carried out on a sample of wood and the force is applied at the end of the grain surface, the test is aimed at the end hardness. Usually, the end hardness of a particular wood, timber, or lumber will be harder or higher than the side hardness. Generally, when Janka test is applied to different species of wood, the results usually come out in standard Janka measured test. We can categorize hardwood into two types: Domestic wood and exotic wood. Domestic woods are mainly hardwood floorings such as White Oak, Red Oak, Maple, and others. These are very popular for home flooring across the U.S. These types of wood are perfect for harmonizing existing furniture or cabinets, and also ideal for traditional settings. No doubt, the natural class of the Red Oak remains the most preferred types of wood which makes it the standard hardness rating for Janka testing. Usually, domestic hardwoods have the tendency to maintain brighter tones of colors, unless they are stained. Exotic woods, on the other hand, have the tendency for more color variation across the board with more remarkable grain patterns. There is a growing trend among homeowners choosing these exotic wood variations simply because they offer natural warmth and provide more distinctive and unique appearance than the traditional oak wood floor. Naturally, exotic species of wood have higher rates on Janka Hardness scale when compared to the regular domestic woods. 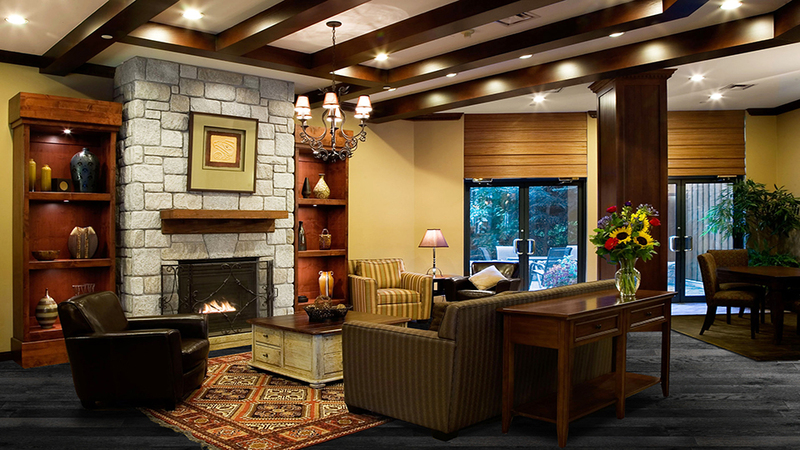 Exotic wood looks stylish and beautiful in any kind of setting. Below are the details of the different wood species and their Janka Hardness Test Ratings. Red Oak is the most famous of all the domestic woods; the perfect hardwood choice for flooring. It comes with reasonable to slightly weighty graining with practical color variations. Red Oak, with a test rating of 1290, is considered relatively soft. However, it is the benchmark in the industry for measuring the hardness of various types of wood. The implication of this is that being soft does not mean it is not durable. In fact, many softwoods flooring are resilient enough to endure regular use, particularly with appropriate fitting and finishing. This is very comparable to Red Oak but somewhat stronger when put to the Janka test. With a Janka rating of 1360, it comes harder than the Red Oak. Due to its natural hardness and extraordinary stability, it is usually used for boat building, wine barrels, as well as flooring. The natural White Oak’s color varies from brown to golden with the light gray undertone. White Oak option of flooring comes with the temperate linear pattern and reasonable variations in terms of the color. Maple hardwood comes in pale, white creamy color with minor shade variations from one board to another. It sometimes comes with little or many black/brownish mineral streaks, and the specific one you have depends on the grade you choose. Some Maple flooring contains graining known as ‘birdseye’ which is a unique outline of little spots that look like tiny eyes. 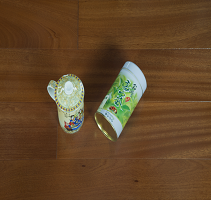 Featuring a Janka rating of 1450, Maple hardwood is well known for its strong and hard nature. It comes with both soft and hard cell structures which makes it suitable for flooring. However, to have the best of this wood species, it is recommended that it is first conditioned with liquid conditioner for woods. This is a more pliable wood flooring when compared to some others. Although it is soft, it has one of the most stylish colors and graining you can find in wood flooring. It has a distinctive charm with its innate color variant. Due to its distinctive graining, many homeowners prefer to use it in larger boards. No doubt, the Cherry wood, with a Janka rating of 950, is softer than many other wood species. However, it has some amazing color and graceful graining that makes it the choice of many homeowners. Birch species can further be broken into two variations of hardwood flooring; Red Birch and Yellow Birch flooring. Depending on your choice, you can have both varieties for your flooring or you can choose between the two. 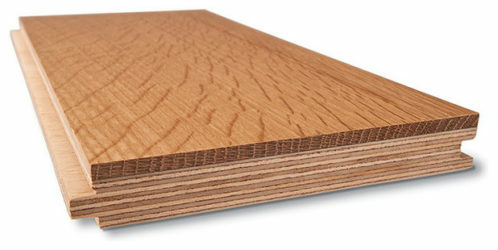 Relatively softer than Red Oak hardwood, the Birch hardwood with a rating of 1260 is also durable for flooring purpose. Popularly referred to as American Walnut or Black Walnut, the Walnut hardwood flooring usually comes with straight, fine graining with rich coloring, close to chocolate brown. Many homeowners prefer the natural colors of Walnut hardwood flooring as well as the warmness it naturally adds to the room. It is essential to note that Walnut hardwood, with a Janka rating of 1010, is softer species when compared to some other wood species on Janka hardness rating. This is why homeowners sometimes settle for the Brazilian Walnut hardwood which comes with a Janka rating of 3680. This is regarded as an exceptional solid standard hardwood. It is also very popular due to its unusual graining and innate color variant. The colors of Hickory vary from medium browns to creamy whites. It is the most popular when it comes to wider planks. With a Janka rating of 1820, this wood is one of the hardest wood species among domestic woods. The wider planks are more popular than the narrow strips because they (narrow strips) tend to look busy with the numerous unique variations and graining within the boards. With a Janka rating of 690-870, Pines are generally very soft and are usually used for undersized, average, or big pitch spots and knots. Pine hardwood flooring is suitable for traditional ambiance and comes in wider plank sizes. The Pine (Yellow) is quite unstable. It’s normal to notice loose gaps in-between its boards in seasonal humidity changes. It usually closes up in humid months. Many manufacturers don’t recommend Pine hardwood flooring due to its soft nature. Popularly called Amendoim, the Brazilian Oak is the choicest flooring among all exotic hardwood types. It comes with a stunning reddish brown/golden tone that varies from intense to average in coloring. Brazilian Oak is very unique due to its nearly holographic look and feel. With a Jaka rating of 1912, the Brazilian Oak hardwood is considered one of the hard exotic wood species that is ideal for home flooring. Also called Jatoba, the exotic hardwood flooring is popular for its great color variant and very high Janka rating. With a Jaka hardness rating of 2820, the Brazilian Cherry is the most preferred among exotic hardwoods for home flooring. Its color outlines consist of blonde/reddish highlights, brown/reddish tones, and sometimes, strong selections of red color. With a Janka rating of 2200, Santos Mahogany, popularly called the Cabrueva, is the second most famous option of exotic hardwood flooring. It is quite sturdy, durable, and perfect for flooring purpose. It features quite a number of color variants but a little dimmer when compared to Brazilian Cherry. The color variations range from dark brown to orange/medium brown. The graining is curvy and integrates an open outline. With varying light exposure, the colors become richer over a period of time. Within three months, the colors will attain total stabilization. Popularly called Bolivian Koa, Tigerwood graining includes dark, solid stripes on the setting of medium brown and pale gold. This exotic wood usually looks perfect on bigger boards due to its intense graining. It features a Janka hardness rating of 2160, which makes it a strong choice for sturdy and durable flooring. The summary of the various hardwood flooring and their Janka Hardness Rating is summarised below. How to use the Janka Hardness Test to your Advantage? If you are looking for new hardwood flooring, you can be rest assured that there are numerous options available to you. However, to have the best of them, the Janka Hardness Test is your best weapon. No doubt, hardwood remains one of the most popular flooring options all over the world but the challenge is in making the right decision for your flooring. It is not only about how the wood looks but more about the hardness and the durability. The questions then would be: what is a ‘good’ Janka hardness test rating, and what is a ‘bad’ Janka hardness test rating? The Janka scale begins at Zero being the softest option of wood, and ends at 4000 being the highest on the scale. When asking questions about woods, it is crucial to bear in mind that a ‘good’ or ‘bad’ Janka rating is only an indication about the wood species. There are other factors that need to be considered when deciding on the durability and the aesthetic value of flooring in the long term. You need to consider the traffic, preventive measure against wear and tear, as well as the maintenance requirements of your floor. Generally, a rating of 1000 and higher is considered the standard option for flooring. This means any hardwood with a Janka rating of 1000 and above is considered good. What this would mean is that any wood below the 1000 Janka hardness rating is bad but this is not true. There are many other factors that add up to the durability of a wood. There is no rating that is ‘bad’ in the real sense of the word based on the reasons that have been highlighted above. A closer look at softwood and hardwood in home flooring is sufficed to show how maintenance and proper care play a significant role in the durability and appearance of the floor in the long term. Consider a home where softwood flooring had been installed, say American Cherry with a Janka rating of 950. The homeowner takes great care in the proper cleaning of the floor and not allowing sand to accumulate in the house, even though there is high foot traffic in the home. Ten to fifteen years down the line after installation, the flooring maintains its new look just as if it was just installed. The Janka rating of the Cherry may make people believe that it is a bad choice for flooring but in actual fact, it is a perfect choice for the homeowner. Now, consider another home with Brazilian Cherry flooring with a Janka rating of 2820. This is considered a sturdy hardwood based on the rating. Imagine that the owner is not very keen on cleaning and maintaining the floor even though they have a high foot traffic in the home. Few years, let’s say five or six years after installation, the flooring begins to look bad and may require replacement. Of course, the Janka rating indicates that it is a better choice for flooring because of its hardness, but the end result shows otherwise. 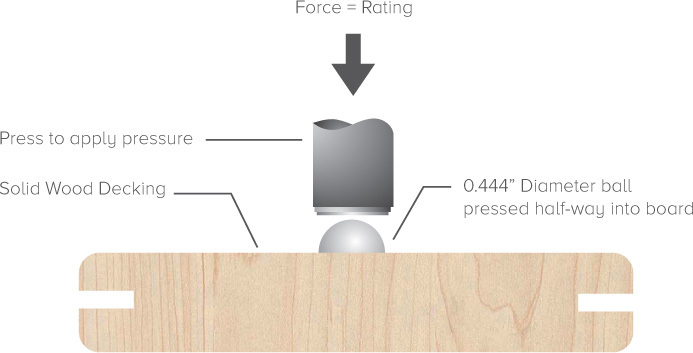 This illustration supports the point mentioned earlier that there are other factors that add up to how durable a hardwood is, in addition to the Janka hardness rating. It is important to consider the place of engineered hardwoods on Janka Hardness scale. The shocking fact is that they don’t have a place on the scale. This is simply because engineered hardwoods are designed with a coating of softer wood under them; therefore, the hardness cannot be measured correctly on the scale. However, logically, it can be assumed that engineered hardwood flooring with the thicker layer of strong hardwood might be very sturdy, but again, this is not necessarily the case. It is therefore recommended that you don’t focus on Janka hardness rating when buying engineered hardwood for flooring, but rather, some other parameters, as advised by your flooring consultant. It is important to point out that Janka Hardness test score is not 100% precise. As a matter of fact, it is more of a ballpark value and not cast in stone. In addition to the hardness of your flooring, you also have to consider factors such as construction and finishing, which will directly impact the durability of your floor. The Janka hardness test measures how hardwood is. It's measured by how much force it takes to drive a steel ball into a plank of wood.